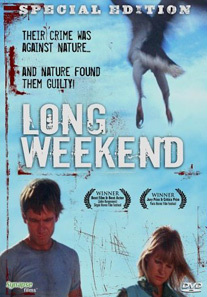 Attempting to resurrect their failing marriage, Peter (John Hargreaves) and Marcia (Briony Behets) set out on a camping trip to a deserted stretch of the Australian coastline in the hope that a long weekend in the sunshine will help them patch their differences. They are a careless couple, littering the countryside with garbage, shooting guns and even driving away after wounding a kangaroo with their automobile. Their callous disregard for the environment soon becomes apparent when the animals start to seek vengeance. Marcia and Peter have proved themselves to be destroyers of nature. Will the animals allow them to leave or will they be destroyed? From the writer of ROAD GAMES and RAZORBACK comes this “spooky little gem” (Premiere Magazine), presented here for the first time in a new anamorphic High-Definition transfer with a re-mastered 5.1 Dolby Digital Soundtrack and great extras!